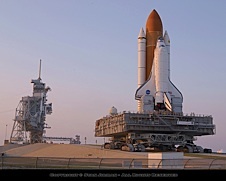 I saw a space shuttle launch for the first time in 1994 (STS-59). That time I also had my first encounter with the VAB, back then still with the Bicentennial logo instead of today's traditional "meatball" NASA logo. Back then, I just rode by it in one of the space agy four axle tour busses (which have since been retired). That was when I decided that one day, I'll get inside and will see how business is really done. A couple of years later, I talked to my friend Peter who's well connected with NASA and who facilitated numerous launch passes for me. We were talking about many things including travel. I told him that my top two dream travel destinations were Antarctica and the inside of the VAB. He laughed and said that I'll get to Antarctica well before the VAB. Coming from him, that was not encouraging - but true: I got to go to Antarctica in 2004, with no VAB tour in sight. Fast forward to 2006. One of Peter's friends is Jay, and Jay's cousin is Alan. Alan happens to be an astronaut. 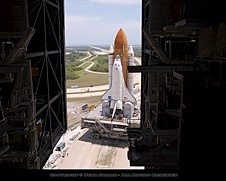 Somehow he heard of my quest to get inside the VAB, and things took right off, so to speak. So it came that one evening I abandoned my wife and baby daughter and found myself on a redeye flight to Orlando, with more photo gear than a mule can carry. Among other things in my bag was a P45, which you either know or don't care what it is =) This was to be a short yet extremely memorable trip, and I think you don't have to be a total nerd to appreciate it. Feel free to read on.